The owners of "the" American importer of German wines coerced some of his associates to come to San Francisco to speak about their vineyards, winemaking and wines. We began the tasting with 2001 Estate Rieslings from Zilliken. This is harvested as a "must weight" (measure of sugar in the juice) of 74 chsle, more than the minimum of 70 chsle for Kabinett wine designation. Still, Zilliken offers this as a Qba level wine, adding enough sugar to bring the juice to 91 chsle. The regulations require a minimum of 51 chsle for Estate Riesling designation! Zilliken brings the juice to more than Auslese sweetness and ferments it to 10.5% alcohol. The high acidity balances the 16 grams/liter of residual sugar, resulting in a wine that strikes the palate as being close to dry! 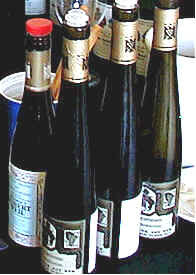 Zilliken's "normal" Estate Riesling was harvested at 75 chsle and was chaptalized to 86 chsle. This he fermented to just 9% alcohol, leaving 38 grams of residual sugar. The wine is fruity and certainly noticeably sweet, but, as importer Rudi Wiest pointed out, "You wouldn't guess it to have that much sugar because of its crisp acidity." Zilliken suggested pairing this with "spicy, Pacific Rim cuisine." The regulations require 85 chsle for a Rheingau Sptlese, yet Weil's weighed in at 92 chsle! It's fermented to 12% alcohol and has just 8.5 grams of residual sugar, to this strikes the palate as being rather dry. Mr. Jochen Becker-Khn says leaving the wine totally dry "is a mistake. It is not possible to produce a Chablis from Riesling." This was very fine. ROBERT WEIL 2001 ESTATE RIESLING SPTLESE "Halb-Trocken"
Picked at 92 chsle, this was fermented to 11% alcohol and has 16.2 grams of residual sugar. The key is balance and this wine certainly is that. Picked at 94 chsle, a week and a half after the fruit for the preceding two wines, this is but 8% alcohol and has 70 grams or sugar! It's very fresh, light and peachy in character. Winemaker Fritz Hasselbach picked this at 85 chsle, sufficiently sweet enough to produce a Sptlese! Hasselbach says "Estate Riesling is always a QbA wine, so I chaptalized it to 94 chsle and fermented it to 11.3% alcohol. That leaves only six grams of sugar." The wine is a bit shy and quiet on the nose. Hasselbach explains "This comes from four different sites, all with red slate, It's quite young and not yet showing all its peachy fruit. Give this a few more months." A two site blend from red slate soils, Jean Baptiste takes its name from playwright Carl Zuckmayer. In one of his works featuring a winery and vineyard, set at the Gunderloch estate, the winery owner is named Jean Baptiste. Hasselbach decided it would be less "hassle" to produce but one Kabinett wine. At one point he made Kabinett wine in dry, half-dry and normal styles. "Since Kabinett wines in a dry style are not so concentrated and lack aging potential, we make it only in an off-dry style. I like it to spend some time aging on the yeast following its fermentation." This wine is very nice, showing crisp acidity to more than balance its 23 grams of sugar. Picked at 105 chsle, this wine has lots of fruit. Hasselbach describes it as "Peach, apricots and exotic fruits which are very typical of our soils." This should really blossom with more time in the bottle. "We had to do a strong selection to make this." 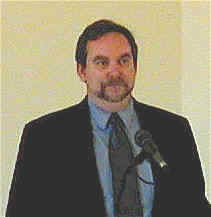 Hasselbach told the crowd. ROBERT WEIL 2001 KIEDRICHER GRFENBERG SPTLESE "Erstes Gewchs"
This is a German "grand cru" or "Erstes Gewchs" bottling which Mr. Becker-Khn explains comes from a vineyard site that's three kilometers from the Rhein river. "It gets long sun exposure in the late afternoon and early evening and we start picking in mid to late October. We're the 'Mosel' winery of the Rheingau, as we retain good levels of acidity but have a bit more body." Though it has 11.2 grams of residual sugar, the wine tastes rather dry. There are some slate-like, minerally notes here. Becker-Khn says "Mango and papaya characteristics will emerge...you can taste the 'start' of the wine now, though." I gave this one-and-a-half stars. This is a classic Riesling. The aromas are incredible, showing lots of fruity and floral notes. It is quite intense and fairly sweet. Of course, Weil's Sptlese is harvested at more than Auslese sweetness! This is a two star wine presently and will develop into a three star wine with additional cellaring. GUNDERLOCH 1996 NACKENHEIMER ROTHENBERG AUSLESE "Three Star"
This Auslese wine is what Hasselbach termed a "traditionally styled wine. It reached Auslese sweetness without Botrytis Cinerea. I wanted to create a wine that's very clean and crisp tasting. I don't really regulate the fermentation, either. I let it go and finish on its own." Here's a powerful wine of 14.4% alcohol (and you thought German wines were all light!). It has 20.5 grams of residual sugar. Though Fritz calls this "Drei Stern", I gave it one star. This wine is not yet released, even though it's nearly 5 years old! This is made from grapes which have been affected by Botrytis Cinerea, a remarkable example from this particular vintage. It shows lots of smoke, flint-stone notes. Hasselbach points to the style of vinification for these elements, saying the smokiness will disappear by the end of this year or early next year. "It's not SO2," he says, "but yeasty notes." I gave this a two star rating. Very fine. I don't imagine many readers of this page have a huge stash of old German wines, but if you have some aged bottles of Zilliken's wines, you are either very smart or very fortunate. This wine displays a fantastic bouquet, still alive and moderately floral and fruity. There's a mature quality to the wine, which has a hint of smokiness to it. Mr. Zilliken says the vineyards are "steep, south-facing exposures and the soil is a thin, Devonian slate which gives a lot of mineral notes to the wine." The wine is quite high in acidity, probably accounting for its still be alive. This wine displays lots of minerality, with a lightly smoky note and fresh, fruity flavors. The balance is remarkable...nice sweetness and yet not too sweet! One-and-a-half stars. Here's a wine that's still "asleep" compared to the other two! It is crisp and tangy and not as "deep" yet. Balanced on the palate, though. Zilliken says there are two periods when the wines taste good. "In its youth when it's fresh and floral. Then it goes to sleep, closing down. After some years it starts to open again and awakens, showing maturity and complexity. That's when everything is melded together." 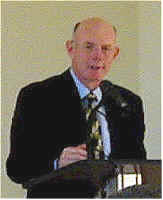 Zilliken further explained his cultivation of Riesling. Comparing the farming to tomato-growing, he says "You can grow tomatoes under ideal conditions in a green house, for example. You can get good color in your tomatoes and no flavor. Or you can grow in nature, on a hillside, perhaps. But you will have smaller fruit. But it will have flavor. That's why we continue our 'struggle' with Riesling." I found hints of a stalky fragrance in this stony, slightly smoky Riesling. The wine is very fine on the palate, being elegant and a bit delicate. Sweet, rich, peachy aromas. Imagine: a wine of 214 grams of residual sugar tasting "crisp." What a delicious wine! Very long finish. Goldkapsel Auslese is a "reserve" designation. The fruit is typically picked at very high sugar levels, exceeding that of Beerenauslese requirements, for example. The sugar requirements for Trockenbeerenauslese is 150 chsle. This "Auslese" was picked at 157 chsle! The wine is off-the-charts! It has tons of really pure fruity notes. Herr Becker-Khn says "Unlike Sauternes, you have really high levels of acidity. The pickers for this sort of wine must be very skilled. They pick into one basket for grapes with botrytis and another basket for those with 'super botrytis.' A picker needs one full day of harvesting to make a half bottle of Trockenbeerenauslese. This is our 'image' wine. These wines make our normal wines more famous." Amazingly deep, rich and fine. And imagine Becker-Khn saying "Success is not where we stand presently, but the direction we are going." Here you'll find tons of honey notes. Hasselbach explains the fruit is 100% botrytized. The resulting wine is more like nectar. "Well, we made it from shriveled berries which looked like raisins." he explains. "We made only 90 liters of this wine. We will bring this wine to auction in 350ml bottles. It's not my idea, but my wife's idea and I always must follow her ideas." What a treat for me to taste this wine!! On the other hand, Fritz Hasselbach says it's a treat for him, too. "I like this sort of tasting because I cannot taste this sort of wine back home." I'd give it four stars on my three star scale. Importer Rudi Wiest was reminded of a story of the owner of Chteau d'Yquem making a tour of Germany. "He was at one winery and the owner pulled out a bottle of 1959 Trockenbeerenauslese. As Lur-Saluces tasted the wine, all the color ran out of his face as he was worried about the competition. He nodded to the owner and maker of the wine, wanting to corner him privately. The Comtes de Lur-Saluces was much relieved to learn of the minuscule quantity of that wine's production. Typically a winery might make only 300 liters of these sorts of wines. Gunderloch made but 90 liters." 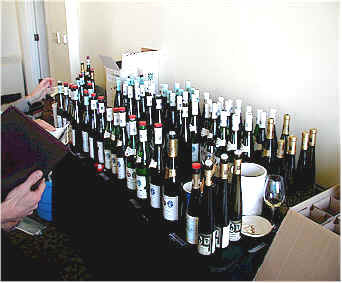 After the formal tasting was adjourned, participants were able to peruse the selection of open bottles and help themselves to a taste. As we often here about the minerality of German wines, a few examples of the soil were displayed. 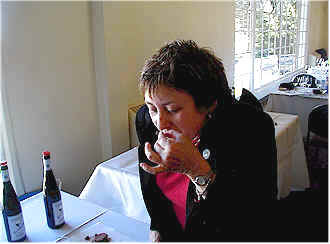 Sommelier Joanna Breslin of San Francisco's fine Ana Mandara restaurant got her rocks off by sniffing and 'tasting' the stones. A big "Thank you" to Brent & Rudi Wiest, tireless "ambassadors" for many of Germany's top estates for coercing their producers to spend a few Euros (can't call their cash Deutschmarks anymore) to come visit and attempt to educate, brainwash (or both) those in the wine trade about the amazing versatility of German wine on the dinner table. It's not everyday one can taste such remarkable wines. For those folks in New York who missed participating in a similar event in that market: You snooze, you lose! (We understand a New York version of this Master Class was poorly attended. What were those people thinking? Was the subway not running that day? !